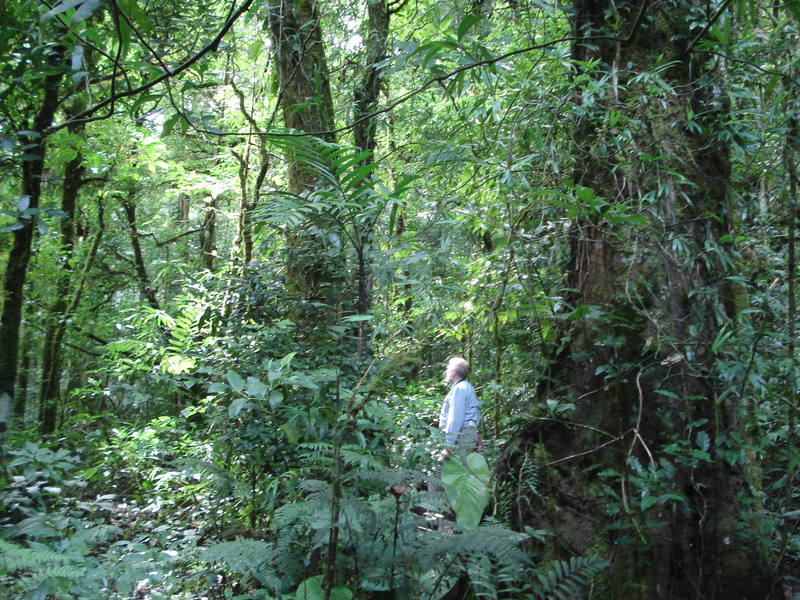 Since we were going to our granddaughter, Leslie’s, wedding in Costa Rica, we didn’t want to be late – so we went 5 days early and spent some time birding in the Cloud Forest regions northwest of San Jose. Our first night in the country we enjoyed a friendly, fun get-acquainted dinner with the groom’s family – his parents, sister, and his best man – at a local restaurant with an abundance of native foods. The meal was delicious with good conversations and stories and laughter – in English and Spanish. They helped us order, explaining items on the menu and about the wonderful juice drinks, made like smoothies with milk. Our goal for this trip (besides the wedding) was to explore three cloud forest reserves and find some new birds for our life list. In a country the size of West Virginia, there are over 800 species of birds – almost the same amount as in all of North America! So far, on our mostly non-birding trips to this country, we had only seen about 1/3 of Costa Rica’s avian wonders. When we’re traveling and birding, we generally avoid guided groups. We like to set our own pace, wander where the bird spirits move us, avoid the crowds where possible, and enjoy the pleasure and satisfaction of finding the birds ourselves, rather than having a guide point them out to us. We recognize that we won’t see as many birds doing it our way, and we accept that. Our 4 previous trips to Costa Rica (beginning in 1999) had been with groups of high school students on a small bus with a driver and guides, so this would be our first trip on our own – doing our own driving, navigating and bird finding. Phil had pre-programmed our GPS for Costa Rica, we had a good map, and I’m a fairly good navigator – so we thought we were prepared. The only thing we hadn’t planned on were roads without route numbers and streets without names. Traditionally, Costa Ricans use landmarks to find locations, such as “50 meters west of the large fig tree”, or “100 meters past the soccer field”, or “the first road past La Cuenca”, a restaurant. This took some getting used to – and as chief navigator, mostly I was a failure. And the GPS wasn’t much better. After traveling north a while on Rt. 1, the Pan American Highway, we reached the “landmark” restaurant and during lunch, watched a pair of Squirrel Cuckoos cavorting in a Guanacaste tree at the same level as our table on a porch high above a river. A short while later, we turned right onto the road that makes its way up and up about 35 Km to the small tourist town of Santa Elena. The Lonely Planet guide to Costa Rica (our favorite travel books) says about this area, “the road consists of steep, winding and scenic dirt roads with plenty of potholes and rocks to ensure that the driver, at least, is kept from enjoying the scenery.” The narrow road skirts around the edges of mountainsides, with deep valleys and a great expanse of valley after valley and mountain after mountain stretching off into the distance – and off to the west we could see glimpses of the Gulf of Nicoya, on the Pacific side of the country. Lonely Planet also explains that in 1983 a National Geographic article appeared about the unique area and how easy it was to find Resplendent Quetzals there, and hordes of birding tourists descended on the place! Local people decided NOT to pave the roads in order to control the crowds and it worked – it is visited by birders but not without some sacrifice of travel comfort. Somehow, with the help of many friendly Ticans along the way, we managed to arrive in Santa Elena, high in the Cordillera de Tilaran, the mountain range of the cloud forests. The cloud forests there are protected in three reserves (similar to our national parks) – Bosque Eterno de los Ninos, The Children’s Eternal Rain Forest, a 82 square-mile reserve; Reserva Biologica Bosque Nuboso Monteverde, the Monteverde Cloud Forest Biological Reserve, 40 square miles; and Reserva Santa Elena, a protected area of 765 acres, a community-managed conservation project run by the Santa Elena high school board. These reserves would be where we would spend the next several days. You can get detailed information and see many photos of these forests by doing an internet search on each one. Our lodging in Santa Elena had been recommended by friends and turned out to be one of the highlights of the trip. Arco Iris Lodge (check it out on line) was within walking distance to the town, bordered by forest – beautiful little cabins tucked into lovingly tended gardens, with a spectacular breakfast buffet each morning – eggs (laid by their own chickens) cooked to order, delicious Costa Rican coffee, home made breads, rice and beans, many varieties of fruits and juices (some grown on the property), cheeses, etc. After unpacking and settling into our cozy cabin, we made our first of many jaunts up an even rougher, steeper, narrower, and rockier road to the Monteverde Cloud Forest Preserve – a very bumpy 5 Km ride that wound higher and higher up into the clouds – at about 5,000 ft. elevation. The weather looked iffy, and it is usually cloudy, so we weren’t sure what we’d be able to see before the weather closed down. We got to the end of the road at the reserve and went first to our favorite hummingbird place – the nearby Café Colibri – a coffee/craft/art shop and hummer feeding station with numerous feeders. We were glad to see nothing had changed since our previous visit in 2008. Coffee and tea still good, hummers still in abundance, and we sat for over an hour, binoculars to our faces, noses in the open bird books, camera clicking and watched Violet Sabrewings, Green Hermits, Purple-throated Mountain Gems, Green Violet-ears, and Coppery-headed Emeralds zooming in and out to the feeders just a few feet from us. But so far, no new birds. We chatted with some fellow feeder watchers, and they offhandedly mentioned that a ranger had just shown them an unusual bird up near the office at the Reserve. So we wandered up that way, a short walk, found the ranger, and there was the bird pecking around on a paved trail – a Buff-fronted Quail-dove – #1 new bird of the trip – a lifer for us. None of our other lifers would be that easy! As daylight waned, we drove happily back down toward town and on the way stopped at Tramanti’s Ristorante, where we had eaten on our previous visit. Great Italian food and our only non-native meal of the trip. During dinner, the rain deluge came down complete with lightning, but it had let up before we were finished and our cabina was cozily waiting for us, with comfortable bed, warm covers for the chilly night, and the sound of rain on the roof.